More than half of hospitals on average fail to comply with the CMS' sepsis treatment requirements, new data from the agency reveals. The data, publicly released Wednesday on Hospital Compare for the first time, show that the national average compliance rate for the CMS' sepsis treatment measure was 49%. But patient safety experts say the generally low compliance rate for the measure doesn't necessarily mean sepsis treatment is poor at hospitals. The measure is a process measure, so it doesn't directly reflect outcomes for patients with sepsis. Additionally, clinical nuance and trouble reporting the measure must be taken into account when looking at the data. The measure—called the Severe Sepsis and Septic Shock Early Management Bundle—was adopted by the CMS in July 2015 to improve hospitals' identification and treatment of sepsis, a serious and life-threatening condition. More than 200,000 people die each year from sepsis, according to the agency. A study last year also found the mortality rate from the condition has worsened in recent years. The measure requires hospitals to follow multiple, time-sensitive steps to comply. Physicians and researchers say that early dedication and intervention is critical to prevent death from sepsis. For patients with severe sepsis, the hospital must measure the patient's serum lactate levels, obtain blood cultures and administer antibiotics within three hours after diagnosis. Hospitals must follow the same steps for patients with septic shock plus additional steps within six hours. 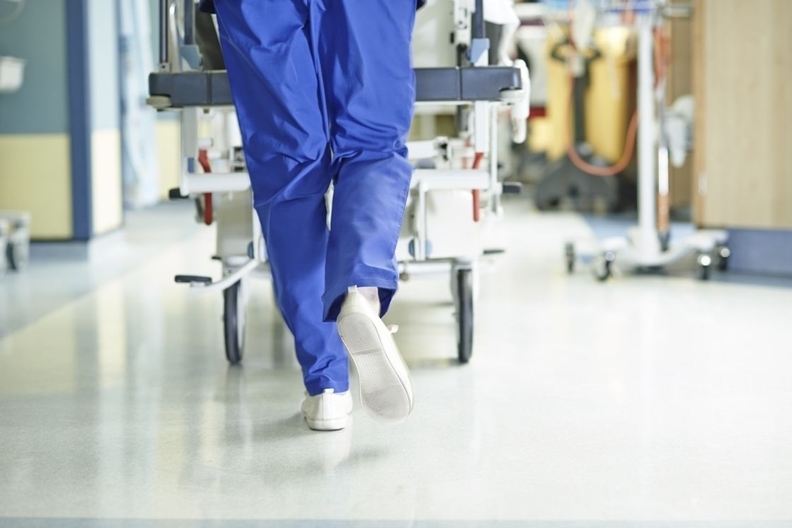 Sepsis has been on hospitals' radar for several years, so the low compliance rate for the measure may point to the elementary nature of its protocols, said Dr. Dave Gaieski, a professor of emergency medicine at Jefferson Health who has studied sepsis treatment. Gaieski points to Rhode Island and Delaware as examples. Both states had some of the lowest average compliance rates for the measure but both states have hospitals that have worked hard on interventions to improve sepsis detection and treatment, he said. For instance, Rhode Island Hospital, which is involved in the Surviving Sepsis Campaign, has a compliance rate of 21% out of a sample of 96 patients for the measure. The statewide average is 40%. Sample sizes are used for this measure, especially for hospitals with high volumes, because it must be manually reported by hospital staff to the CMS. "It makes me wonder whether there is a disconnect between the reporting and the outcomes," Gaieski said. "You could certainly make the hypothesis that places that got involved in sepsis care earlier would be less compliant with the steps if they felt they didn't have the potential to impact the outcomes." Some in the field question if the measure can improve sepsis mortality rates, but there is literature showing it does. A 2016 study found patients at the University of Chicago suffered higher mortality rates when their lactate levels weren't measured in the three-hour time window outlined by the CMS measure. Even so, there will always be limitations to full compliance with the measure because clinical judgment and nuance play an important role, said Dr. David Mayer, vice president of quality and safety at Columbia, Md.-based MedStar Health and board member of the Patient Safety Movement. If the electronic health record alerts clinicians the patient has signs of sepsis, the team has the power to decide if going forward with prevention treatment is appropriate. "Every time you activate that bundle (the CMS measure), the patient may not have sepsis. Sometimes it (sepsis) is obvious, but 25-30% of the time it's a false trigger," Mayer said. "We still want good clinical judgment, and we don't want to be overtreating those who we feel pretty confidently don't have sepsis." There is also the issue of proper documentation of the measure. Although MedStar is vigorously keeping tabs on sepsis, there is the potential the measure isn't documented appropriately or in time for the hospital to be considered in compliance. The measure must be manually entered by doctors within three-hour and six-hour windows. Doctors can document too late, so staff who code services are forced to say the measure wasn't used. "Many times when we go back in the charts we are compliant with many of these bundles, be it sepsis or ventilator-associated pneumonia, but someone didn't document it correctly or they documented later in the day," Mayer said. However, Mayer emphasizes that he isn't following this process measure as much as sepsis mortality. The outcome measure tells him so much more about clinical care and opportunities for improvement. "What CMS has done with sepsis has elevated everyone's game and made us all aware of the importance of compliance but I take these numbers with a grain of salt," he said. The CMS data set includes performance of 3,005 hospitals for the first nine months of 2017.